This Friday night, undefeated bantamweight Christian Carto will headline a 10-bout card when he takes on his toughest foe to date in Alonso Melendez at The 2300 Arena in Philadelphia. 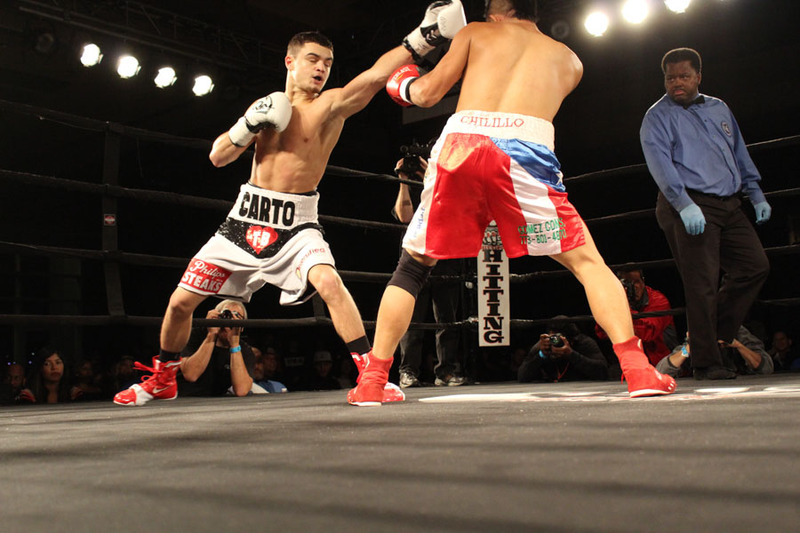 Carto (11-0, 11 KOs) of Philadelphia has developed into one of the top prospects in the Philadelphia region and combined with his growing fan base, Carto has become a must-see attraction. “Everything has gone great in camp. I feel really good for Friday,” said Carto. In Melendez, he is fighting a tough fighter from Mexico who sports an impressive mark of 14-1 with 12 knockouts. Ever since he was an amateur, Carto has been a popular fighter, drawing large crowds, but since becoming a professional, Carto is starting to build into an attraction, where he is starting to acquire more and more fans with each fight. This being his 12th fight in 14 months, Carto has kept a busy schedule, and should everything go well on Friday night, Carto could see more action as 2017 closes out. Carlos Rosario (7-2, 4 KOs) of Pennsuaken, New Jersey and Jerome Conquest (8-2, 1 KO) of Philadelphia will meet in a highly anticipated eight-round lightweight bout. Mykal Fox (14-0, 4 Kos) of Forestville, MD will take on Marlon Aguas (9-1, 4 KOs) of Quioto Ecuador in a eight-round welterweight bout. Maynard Allison (9-1, 6 KOs) of Philadelphia meets Juan Rodriguez (7-7-1, 5 Kos) of Haymarket, Virginia in a junior lightweight bout. David Gonzales (8-2-2, 2 KOs) of Philadelphia battles Darius Ervin (4-1) of Los Angeles in a super lightweight bout. Erik Spring (9-1-2, 1 KO) of Reading, PA will fight Anthony Prescott (6-7-2, 2 KOs) of Cherry Hill, NJ in a super welterweight fight. Brandon Robinson (6-1, 5 KO’s) of Upper Darby, PA battles George Sheppard (1-2) of Norfolk, VA in a super middleweight bout. Robert Irizarry (3-1-1) of Cherry Hill, NJ fights Bryan Perez (2-7-1, 1KO) of Carolina, Puerto Rico in a super featherweight fight. Rasheed Johnson (1-1) of Philadelphia battles Demetrius Williams (1-3) of Philadelphia in a welterweight tussle. Amir Shabazz (4-1) of Philadelphia will square off with Alan Lawrence (1-0, 1 KO) of Newark, NJ in a light heavyweight bout. The first bout begins at 7 PM ET and the broadcast will begin at 9 PM ET. Who Is Boxing’s Pound For Pound King Right Now?